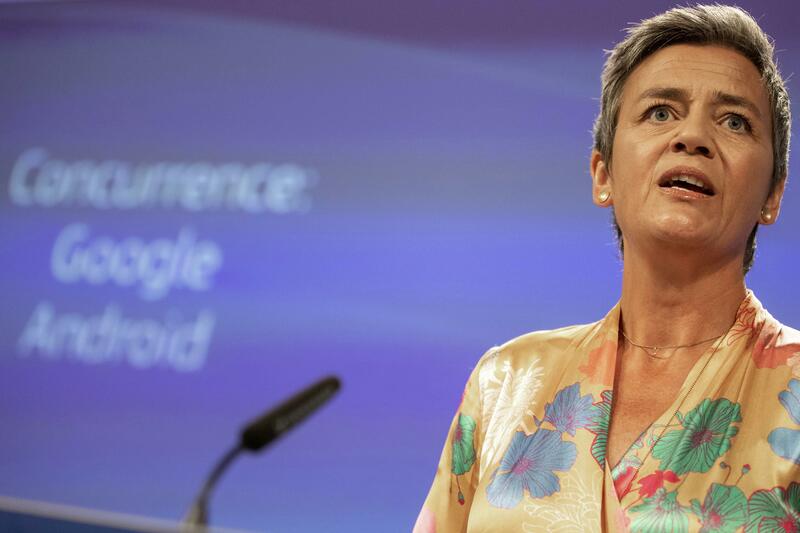 Wed., July 18, 2018, 1:41 p.m.
BRUSSELS – European regulators came down hard on another U.S. tech giant Wednesday, fining Google a record $5 billion for forcing cellphone makers that use the company’s Android operating system to install Google search and browser apps. While Google can easily afford the fine, the ruling could undermine the company’s business model, which relies on giving away its operating system in return for opportunities to sell ads and other products. Android has “created more choice for everyone, not less,” Google CEO Sundar Pichai tweeted. The bundle contains 11 apps, including YouTube, Maps and Gmail, but regulators focused on three that had the biggest market share: Google Search, Chrome and the company’s app store, called Play Store. The penalty is on top of a $2.8 billion fine that regulators imposed on Google a year ago for favoring its shopping listings in search results. Android is an open-source operating system that Google lets cellphone makers use for free. As a result, it is the most widely used system, beating Apple’s iOS. Google argues that letting phone makers choose their apps could hurt the company’s main means of making money through Android – advertising and the sale of content and apps. Apple, in contrast, makes most of its money from the sale of devices. Published: July 18, 2018, 1:41 p.m.